After returning to the UK from Lindos, and shivering for several days, I was only in work for a couple of days before having another planned break from it. This time, the reason was for attending a Tom Petty concert down in London with family, and we'd decided to make a mini-break of it, staying overnight in a Kensington hotel. Concert was fantastic - Petty still has a fantastic voice and the band were brilliant too, and the sound in the Royal Albert Hall was superb too. But this isn't a rock music blog, so on to the three days after the trip. 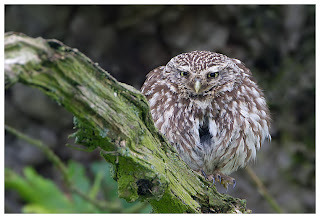 Friday, was as usual wet to start with, and after having a lie in for once, I chose to potter down to look for the little owls. With it being cloudy, the usual problem of their tree being backlit after lunch wasn't a problem, and as I parked up, I could see one of the pair sat out in the open, close to the road. Glaring at me, of course. 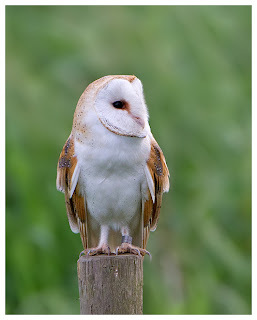 Minimising movements, I was able to get the camera lined up slowly, and then watched as the owl preened and posed, occasionally freezing when something caught its attention below. I had to stop myself from laughing out loud at some of the shapes it managed to create. Saturday was miraculously bright, though very breezy and I had been trying to decide where to head all of Friday and even when stood in the shower on the morning. Gilfach, Bempton and Lincolnshire all interested me, but each had their issues. Wet weather was supposed to be coming in from the west, hence reaching Gilfach first, so that might be a trip too far the wrong way. 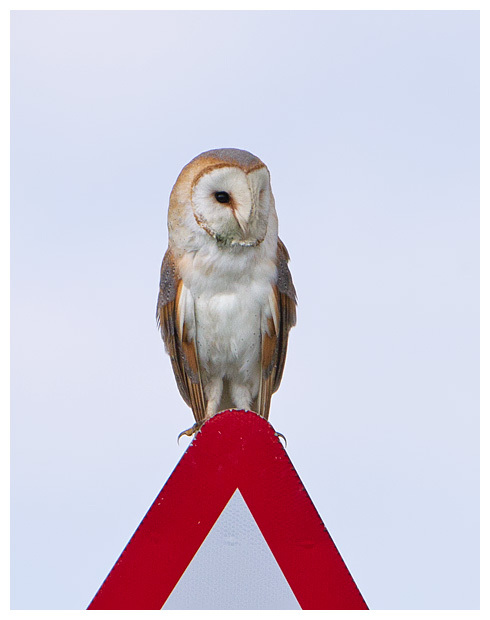 Bempton is windy on calm days and a heck of a drive, and with rain and windy conditions possible later, the barn owl trip was also discounted. Then I thought of Max. I wasn't in the shower by this time, before he starts panicking. 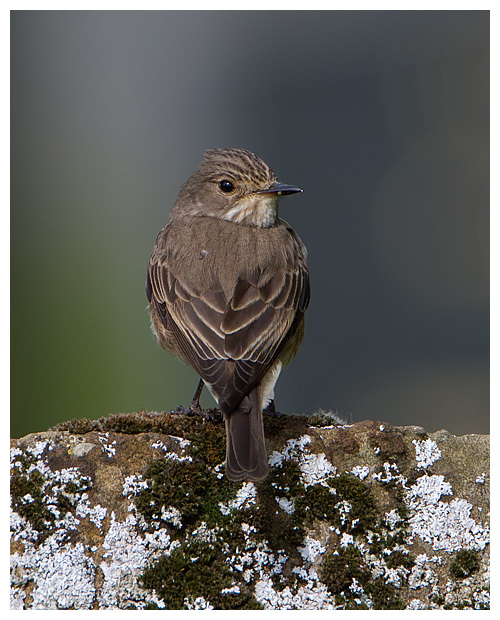 Max has been visiting Napton-on-the-Hill and getting terrific shots of spotted flycatchers (when he gets his camera settings right). I went last year but had no joy, so decided to try again. Closer than the other three destinations too, and I was there in no time, parking up and trying to see the birds in the graveyard. Within five minutes, I'd clocked one dropping down from the leafy cover of an overhanging tree, and perching up on one of the older, weathered gravestones. Bright it was, the strong and persistent wind meant where I needed to be stood to get the best lit shots, was actually rather cold, and it did strike me that I looked a bit weird (more so than usual) stood with a winter coat and woolly hat on, when only a stone's throw away, were several pensioners gardening, wearing light, thin summer clothes! 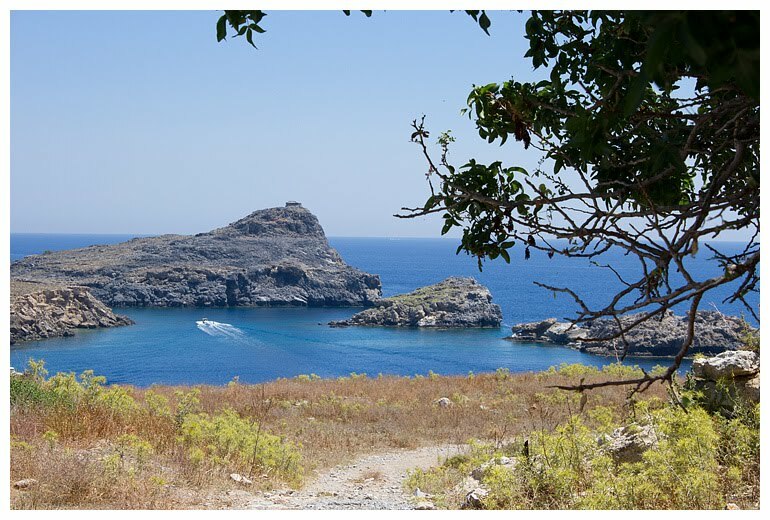 Maybe it was still the Lindos effect making me feel chilled? As usual, it was a case of being patient and trying to second guess where the birds would land. 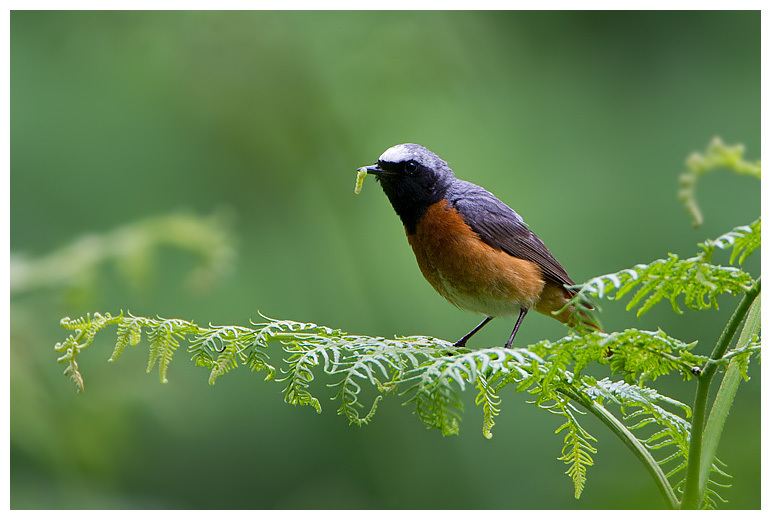 It is a good spot though, as the birds are generally well lit, and have a deep, dark backdrop, making them stand out very well. The wind got the better of my eyes though, and when it eventually rained early afternoon, I chose to go for a drive, not really knowing where I'd head. Maidwell, as it happened. 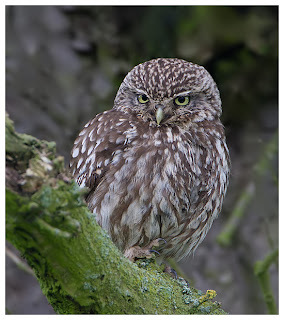 I wondered what might be around when the crowds and most of the owls weren't about. The tracks were as muddy and pitted as before, though my newer car copes much better than the old Fabia did, so that wasn't a concern. The fields were now full of growing crops, and those set aside for the owls were carpeted with wildflowers and long grasses. Lifting out of this, with bursts of song were skylarks, though they stayed well into the field, and out of reach of my lens. 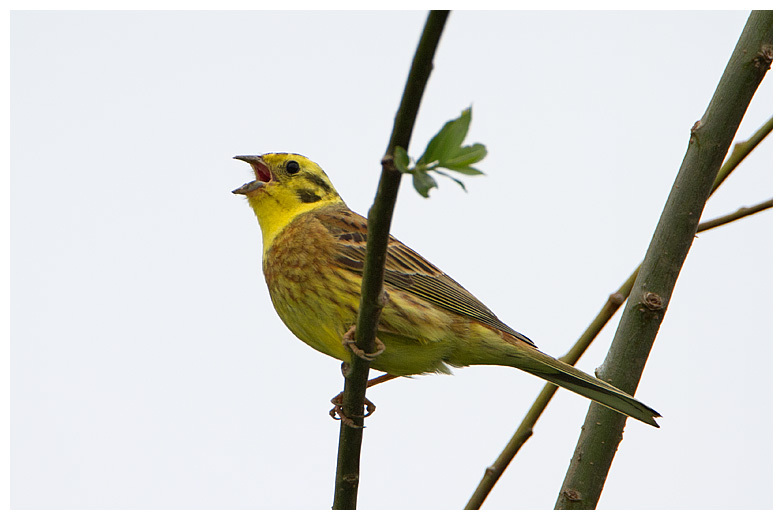 The hedges however, were closer, and these seemed to be favoured perching points for yellowhammers. I did also see a pair of grey partridges, but before they could scurry close enough for a worthwhile shot, a pair of hikers spooked them, and they flew off, low across the crops. I'll get some shots of these game birds eventually. I should really have had another lie in on Sunday, and when the rain started to pelt down on my hat, as I wandered through the wet ferns of Cannock Chase, I did question my sanity once again. 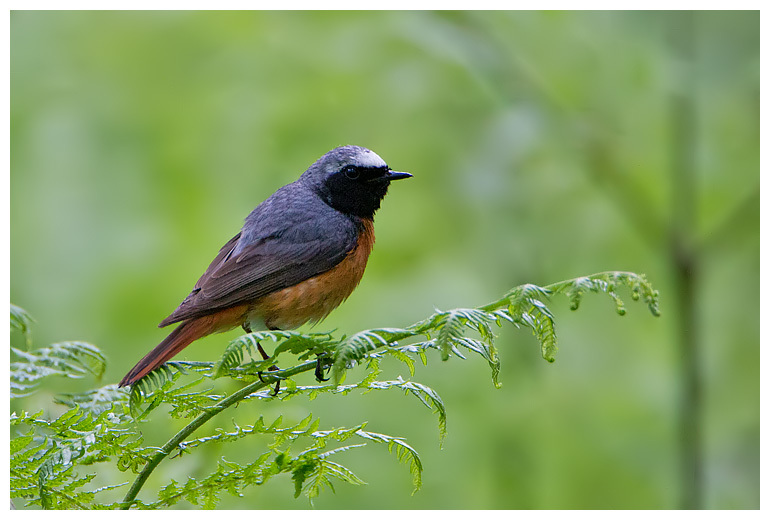 This time I was trying for common redstarts. It's almost become a tradition, searching for them here each year, although this time I knew I was a bit later than usual. It took a good couple of hours of searching to find, and even when I did, they weren't easy to keep a track of. It turned out that the chicks had fledged, and were also competent at flying, so the parents were encouraging them to move around the woods, often quite a distance at a time, without calling too, which meant one minute I thought I was getting close, guessing the bird might return to feed one of the young, only to discover ten minutes later that they'd all moved, and I had to resume the search. I wasn't going to give up though, and kept trying. Typically, when I did manage to get close, the sun would be smothered by dark clouds, or worse still, it'd start raining! 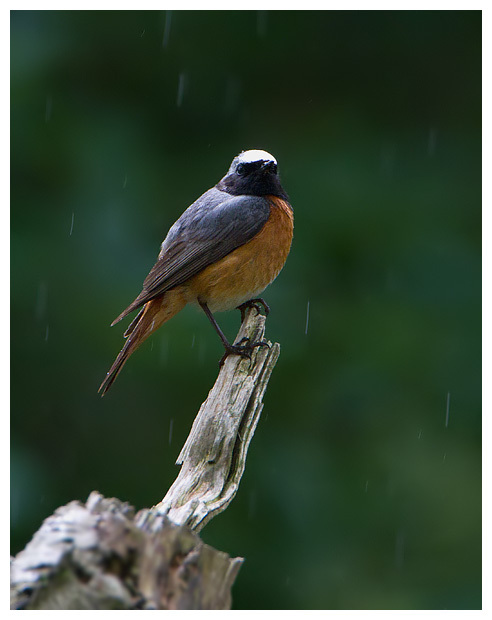 Still, it was good to see that despite the rubbish weather we have suffered of late, this family of redstarts had at least increased their numbers, and that's all that matters. With hindsight, I should probably have stayed longer, instead of heading back to meet family and friends, prior to England's Euro Cup game. What a waste of time. But this isn't a football blog either, thank goodness, so I'll leave it there! 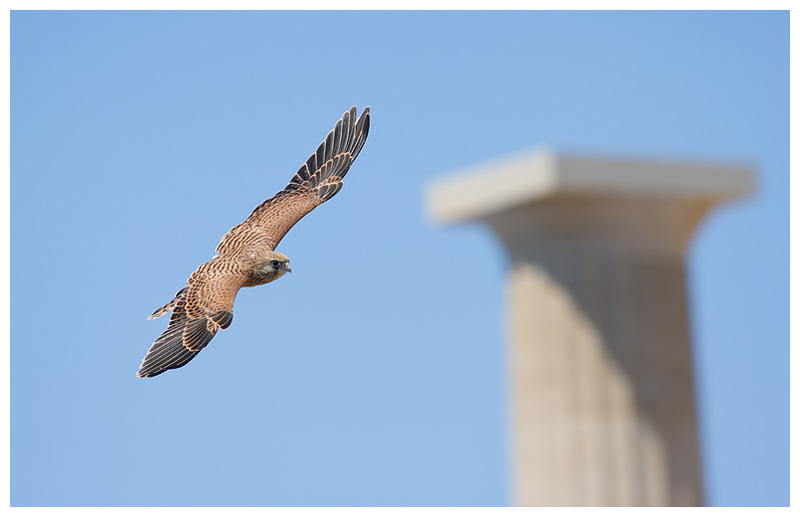 This year's trip to Lindos on the Greek island of Rhodes was a bit later in the year than last, and as a result meant I had missed a lot of the birds nesting, so despite actually making the effort to take my 7D and 100-400mm lens, the apartment complex was sadly lacking in wildlife, at least of the feathered variety. 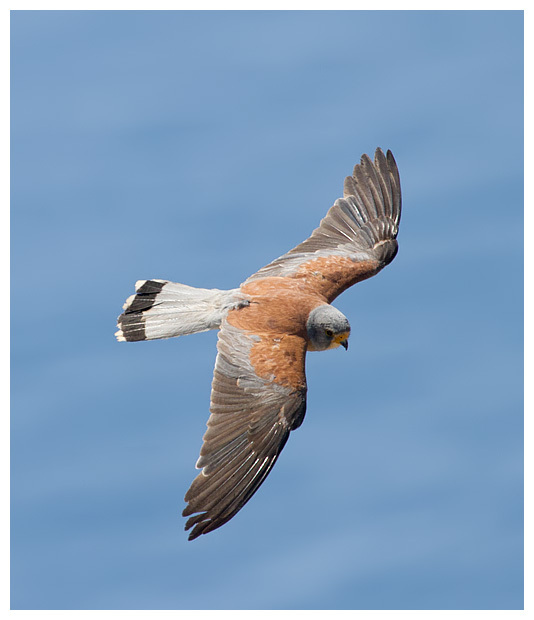 Even the kestrels, which seemed to fly overhead once every 30 seconds or so last year, were noticeably absent. The sparrows, doves and hooded crows were still present at least. That said, the agama lizards were still abundant and up to their amusing antics, fighting, leaping, sun-bathing and breeding - well at least I assume that was what was going on, as several times we spotted much smaller lizards hitching a ride on the back of larger ones. 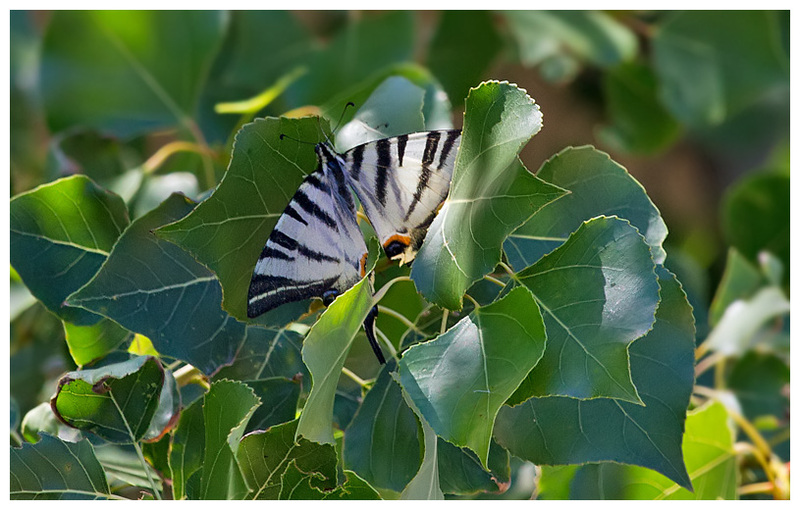 Insects too provided interest with very large swallow-tail like butterflies gliding around, never perching anywhere near for a decent pic. Of particular interest were the huge crickets over there. 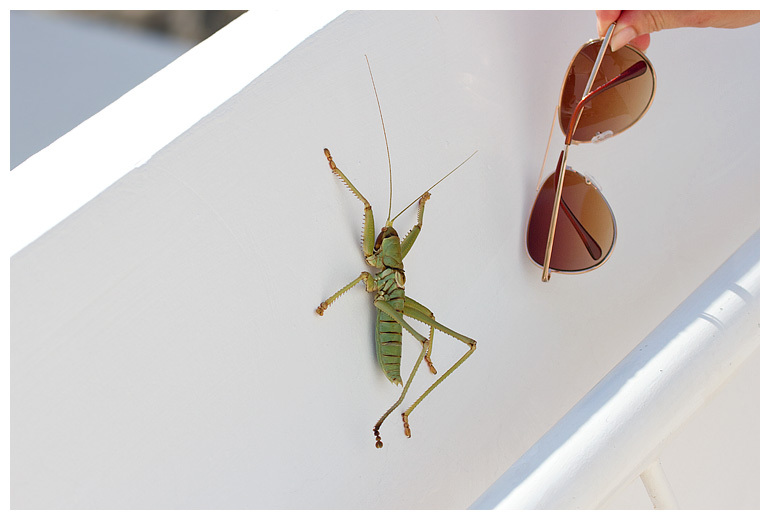 One afternoon when hanging her towels out to dry on her balcony, my sister spotted a huge insect, and shrieked thinking it was a spider. Her husband came to the rescue, but even with him shaking the table violently, the insect held on! Apparently it required a stick to prise it off! It then relocated to some rocks nearby, where it munched on something for several hours. We finally caught up with it again, as it was stuck to a wall of a staircase. I took the opportunity to photograph it, along with something to show the size. After some research (later back home) we think it's a predatory bush cricket. Certainly doesn't look like something you'd want to mess with! With the wheatears not around, I decided I'd need to go find something to photograph, and on Monday morning, got up early and braved both the heat (was 30C in the shade at 8am) and the crowds to head to the Acropolis, where I hoped to photograph the kestrels nesting on the cliffs behind the ancient building. If only I'd asked a local before trying. Walked all the way up the hill to find it is closed on a Monday. D'oh!! Rather than waste the trip, I followed the path around the back, and found a wooden viewing platform, where I could photo the kestrels, albeit from beneath them. Got good views of course, but it wasn't the angle I was after. Further down towards the sea I did find a pair of black-eared wheatears, but they were as flighty as the UK birds, and wouldn't let me anywhere near. 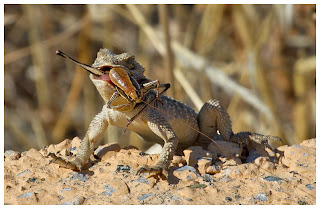 So I took a few scenic shots and yet more lizards! Tuesday brought masses of coaches, and took me once more, to the Acropolis. 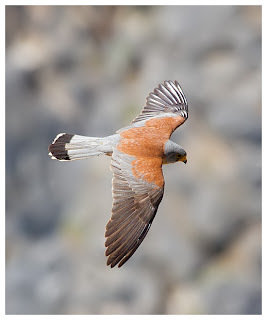 This time it was open, and after queueing for a while, I escaped the crowds and found a spot by the wall at the cliff-top, where I could see the kestrels flying around underneath. I think they were mostly lesser kestrels, but the females and juvenile birds seem to be remarkably similar to normal kestrels in their markings. 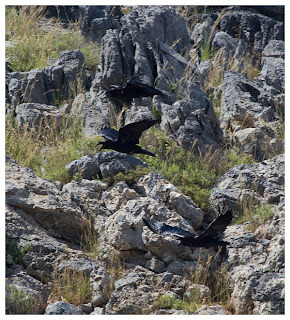 The males were clear though, with their clean colours, and on that sunny, hot morning, with the blue sky and sea beneath, it was heavenly to photo them as they zoomed to and from the cliffs, catching thermals, stooping to grab unwary insects, and occasionally having mid-air scuffles. Sweat was a problem though, and made gripping the camera and lens quite tricky. And the inevitable heat haze off the cliffs affected focusing too, but to be there, with such breathtaking views and to be able to watch these fabulous birds of prey flying at eye-level with you was something quite special. Definitely worth the hike up there! Occasionally, the juveniles would even choose to land nearby, allowing for much closer shots. 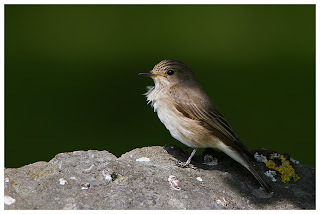 That said, I missed several shots when the birds flew too close to focus on! You could definitely see them taking a look at me as they cruised past. Eventually the heat got the better of me (I was told it was reaching 47C in the sunshine during the middle of the day) and for someone fair-skinned like me, it wasn't wise to be stood in the open at the top of a hill! 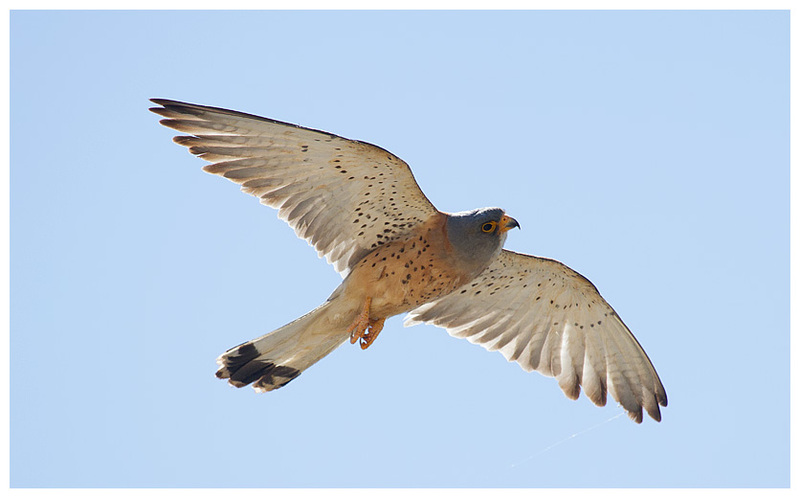 The coolness of the pool and an iced glass of lager tempted me away, but not before I'd filled a card on these kestrels. 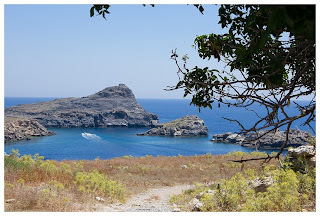 The next day I had planned to walk to the cliffs where the Guns Of Navarone had been filmed. However, by then not only was it staggeringly hot, but the humidity was extremely high too, and just walking half a mile nearly killed me. The cliffs would require a decent hike, and I just couldn't be bothered! So I headed to the bottom of the cliffs of the Acropolis, behind St Paul's Bay. 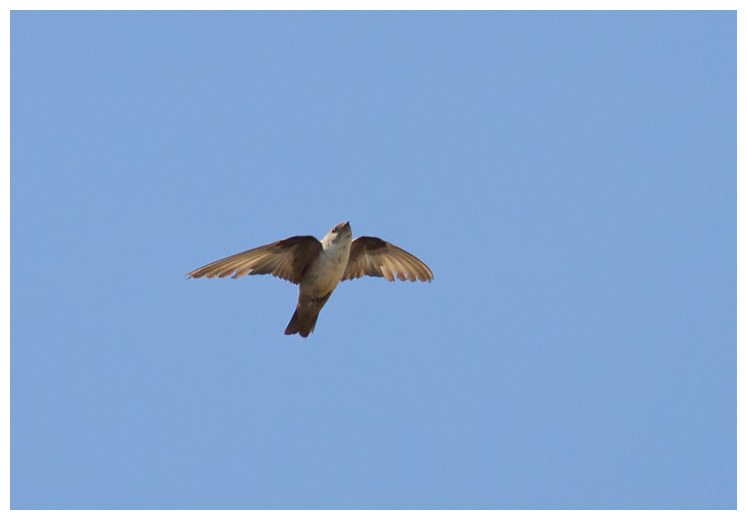 I tried in vain to photograph the Alpine swifts, but they stayed way too high, and the crag martins, while lower down (at head height) were so fast, it was nigh on impossible to focus, especially with sweaty hands again. That's my excuse anyway! 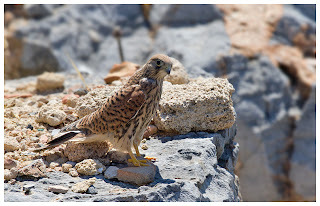 A few more close encounters with juvenile kestrels provided more images, but a beautiful bird song caught my attention. Wandering round the rocks, I spotted a blue rock thrush. I managed a couple of shots before it flew off, this time getting a bit better end-results than last year. Lovely looking birds. By lunchtime, not only was my stomach reminding me it needed filling, but the heat and humidity was making it feel like being in a sauna. Even the breeze was hot. Back to the pool for cooling off, and one of their delicious egg & bacon baps (I know, not exactly Greek cuisine!). The remainder of the break was spend relaxing and not lugging the camera bag around. And wondering if we'd get any aftershocks after experiencing a decent earthquake at the start of the break. Dad and I felt our chairs wobbling whilst sat on the balcony (I wondered if I'd had too much pop the night before for a moment) and we later found out that it had been centred just off the coast at Rhodes town, measuring about 6 on the Richter Scale. 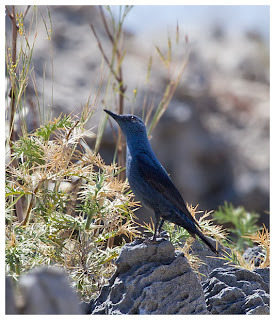 We did see a few other different species of birds, including a crested lark (I think), a red-legged partridge (or maybe a rock partridge, though I am not sure we were in the right habitat) and on the last day, a family of ravens, cronking loudly to each other (and flying open-beaked to keep cool), echoing off the cliffs. The little owls were also around, though only late in the day, when the sun was behind them, and the peregrines stayed very high up. No sign of the long-legged buzzards or the falcons sadly. As with the previous year, the break wasn't for wildlife photography, but once again, it provided a few decent opportunities to do so, and I was glad I'd made the effort to take better gear this time. 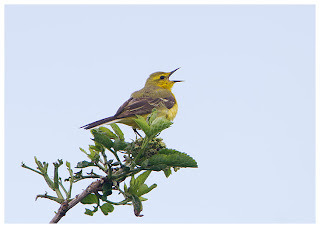 As normal, the (extended Jubilee) Bank Holiday weekend brought miserable weather and only the presence of a wood sandpiper, a bird I've not photographed for years, tempted me out of the shelter of my house to the Flashes at Upton Warren for a look. June, and I was cold, despite wearing 3 layers and a woolly hat, and the driving rain made looking out of the windows of the new hide rather unpleasant. Even the upper tier was chilly - I think I might have developed hypothermia downstairs after too long. Thankfully the sandpiper kindly flew close to the hide after a short wait, and I was able to get some reasonable images as it fed in the closest channel. The view from downstairs would have been preferable, but the grass is a bit long now for a clear shot (hardly surprising after all this rain). When a family of mallards spooked the bird further off, I didn't need to think hard about returning home! The Bank Holiday Monday proved to be better in terms of weather, with sunnier spells promised and only the odd shower. I had planned for a very early start, but after a mammoth shift for work over Thursday and Friday, the alarm at 5am was met with a loud grumble and duly ignored. I eventually dragged myself out of bed when I spotted some sunshine, and after chatting to Ian about one of his favourite haunts in Lincolnshire, I was soon driving east, pretty much on the same route I use to head to Norfolk. Ian couldn't meet me until later, so I had a look around the area. Plenty of birds, with common terns following the waterways, great crested grebes fishing below them and large numbers of swans gliding gracefully by. The skies were full of swallows, martins and swifts, with the occasional hobby thrown in for good measure. 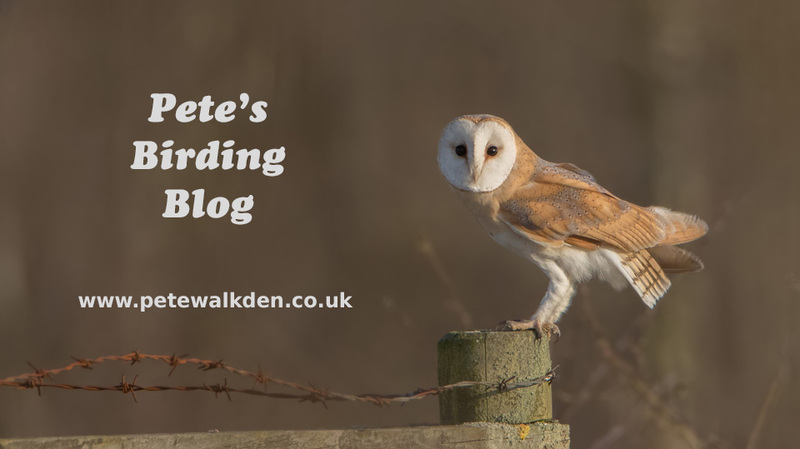 The fields were alive with the song of buntings and larks, and any pathways winding through the crops were being used by pheasants, red-legged and grey partridges and annoyingly distant hares. The first bird that caught my camera's attention was a hovering kestrel. As though it had been glued to the sky, it remained fixed in place, looking down into the grasses below, wings flapping furiously. The light was a bit difficult, but with somewhere to park nearby, I managed some full frame shots of it in action. Singing from the tops of the bushes were yellow wagtails. Being windy though (the weather, not the birds), it made getting a shot trickier, but they're such a vibrant delight to see, and they have quite a song too. 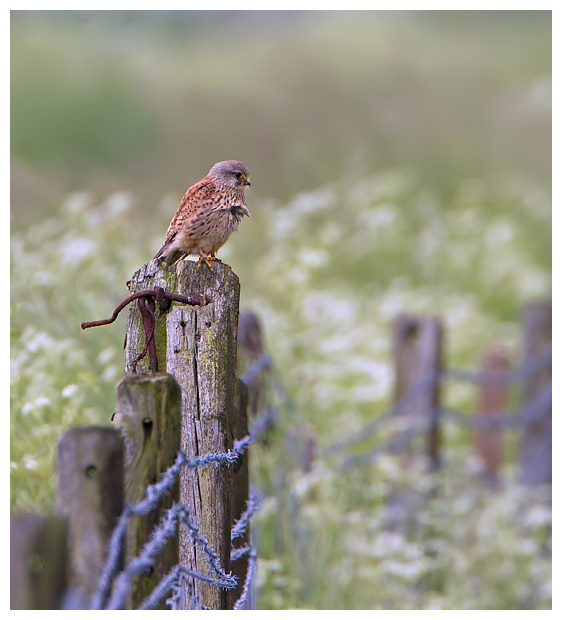 There seemed to be kestrels all over the place, and I managed a quick shot or two of one perched near the road, before a passing car scared it off. 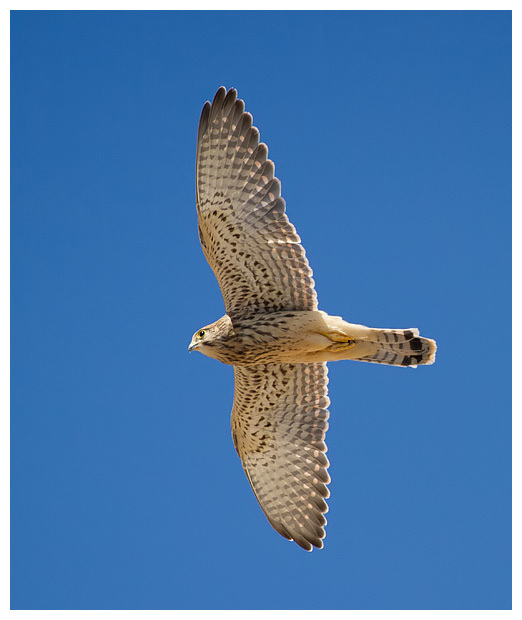 With all these kestrels around, you'd think there might be owls. Well, yes, and this is why I had come all this way. 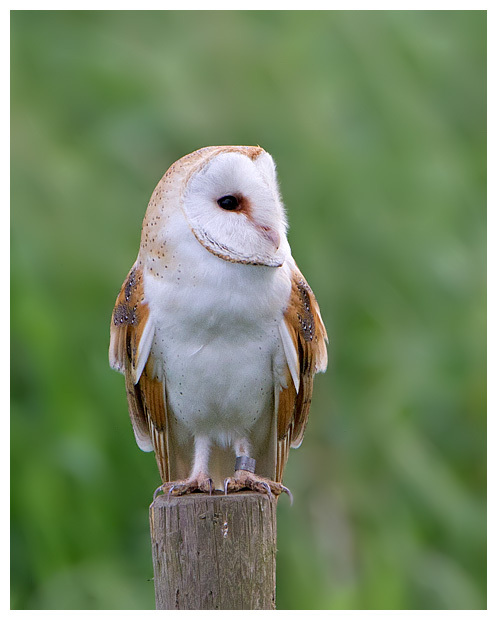 You see Ian comes here for shots of barn owls, and despite having numerous shots of them in flight, I was yet to get anything remotely decent of one perched up. 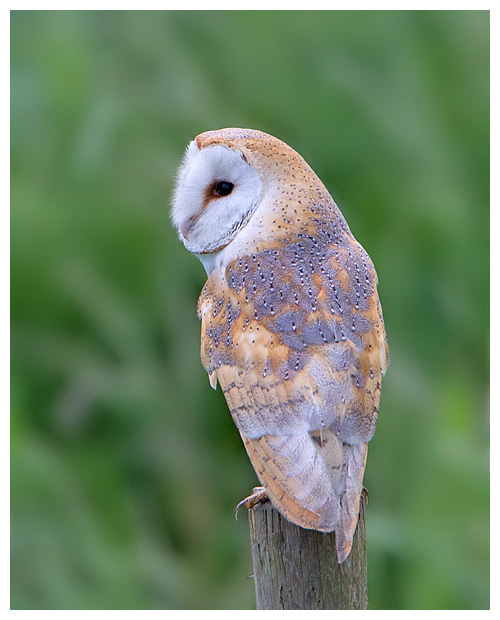 When Ian arrived, he quickly pointed out the nesting locations of several pairs of barn owls, and we simply then had to watch and wait. 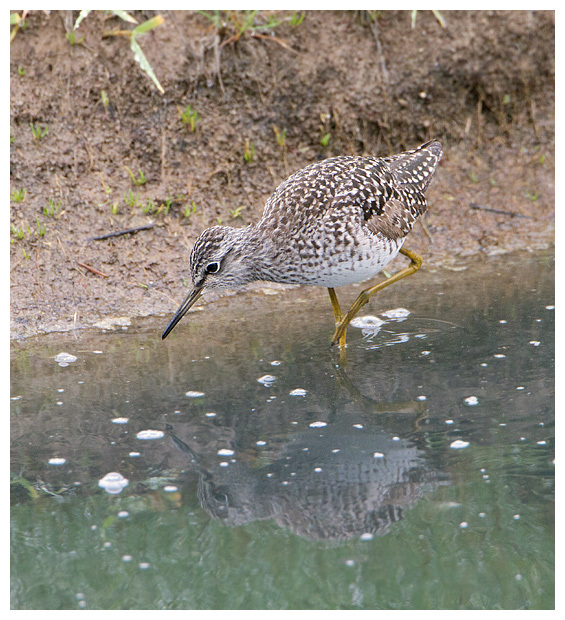 By late afternoon, we were beginning to wonder if they weren't going to play ball, but while I was off driving around, Ian spotted one flying alongside the waterway, but it vanished from sight before a shot could be taken. I arrived back but before I could get annoyed at missing one, I saw another, hunting over the fields. Fantastic. It didn't come close though, and headed away over the crops and towards the roads behind. As I was still sat in the car, I chose to blast over that way and hope. Got to where it had been, but nothing. 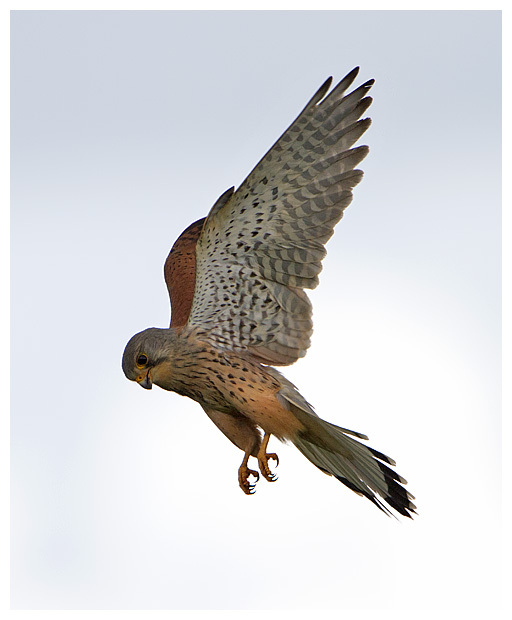 Turned around and was about to return when up it burst from beside the road, flying off away from me, along the verge until it reached a road sign, where it chose to perch up. Ok, it's not exactly the picture-perfect posing perch, but beggars can't be choosers, and I parked up as close as I dared to get some shots. It didn't move, so I approached a bit more. Still didn't go, and for once, there were no cars to prevent me getting a shot. 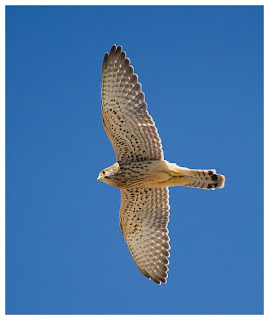 A kestrel however, spoiled the show and chased the owl off, across fields where I couldn't follow. Ah well, back to Ian again. Still no action by him, so off I went again. Further down the road I found another pair, but they just wouldn't perch close, and repeatedly flew out of sight across the water. Then a text came through. "Got one on a post". Was I too late? A hastily executed 3-point turn and I was hurrying back to where I'd left Ian. Slowing down as I spotted his car, I caught sight of a gorgeous barn owl, as stated, sat on a post not far from the road. Before I could get a shot though, you've guessed it. It moved off. 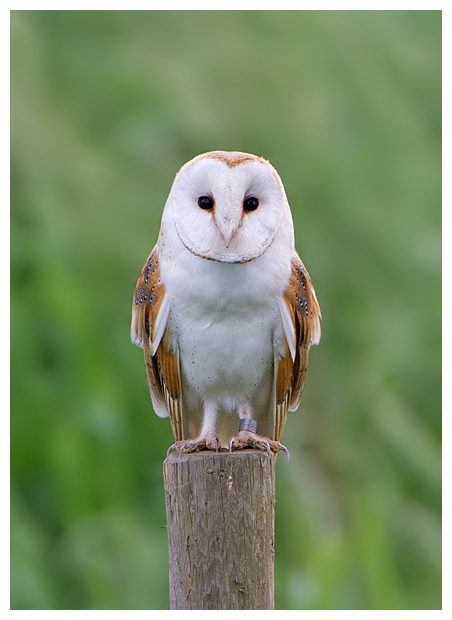 Ian quickly pointed out that if we were careful, chances are, it would find another perch close by, and he was proved correct, as it settled on another post slightly further along the edge of the field. This time I did manage to get set up and finally took some shots of one of these wonderful, ghostly owls, sat still. With its acute hearing the owl frequently looked up at what was making the clicking sound, giving me great views of its heart-shaped face. Movement beneath the post seemed to interest it, and it would often bob its head around and peer downwards. 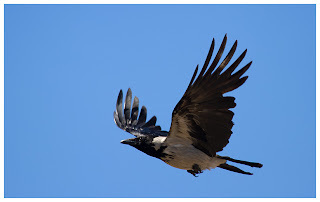 Eventually, it turned its back to me, showing off those wonderfully marked feathers, before it took off, and headed back to its roost nearby. By then though, I had taken a fair few shots and was grinning rather a lot. Which in turn made Ian laugh, though he was already smiling from photographing the same owl. Superb! We saw several more owls over the following hour or so, including ones hunting near us, but they never landed so close again, and when the light blossomed to that gorgeous evening glow, none were to be seen whatsoever! It was getting late and we had to drag ourselves away, though the drive home was brightened by a flyover from another barnie, out hunting near the route home! 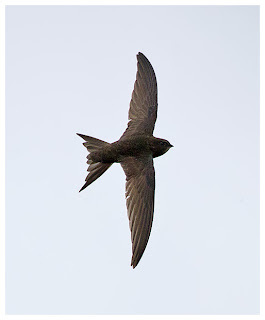 Tuesday was back to the gloom of wet and windy weather, and I spent a few hours trying to get shots of swifts over the Moors Pool. 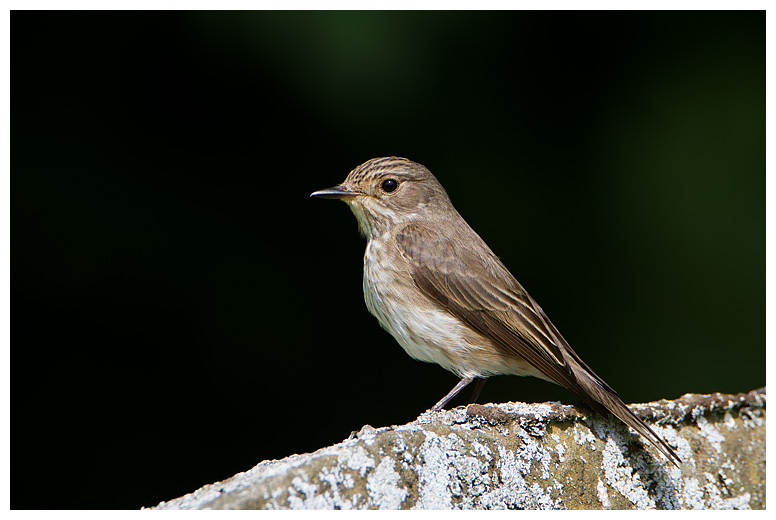 Managed one half decent shot (using the 7D and 100-400mm) playing with varying focal modes. And witnessed a hobby swoop to try to take a sedge warbler in front of the hide, but it missed. More rain arrived and removed what little light was available, and I abandoned the day in favour of a warm cuppa and some home comforts.